Why is my subsidiary DLC idle and not setting up new firms? Capitalism Lab is a major stand-alone expansion for Capitalism 2 with a host of exciting new features and improvements. If you are new to the Capitalism series, you may check out the Capitalism 2 web site first. If you are not sure whether you should buy Capitalism 2 or Capitalism Lab, you may take a look at the differences between Capitalism Lab and Capitalism 2. Why is it called Capitalism Lab? The word “Lab” implies that Capitalism Lab, after its initial release, continues to evolve. Our goal is to keep adding truly innovative gameplay features to the game, further cementing its reputation as the best business simulation game ever released. 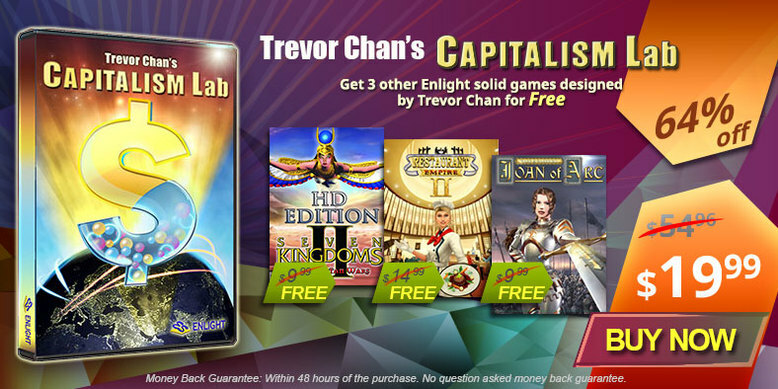 Get 3 classic games designed by Trevor Chan for FREE when you order Capitalism Lab now! BUY NOW READ MORE Read about the timeless gameplay in these 3 FREE classic games. 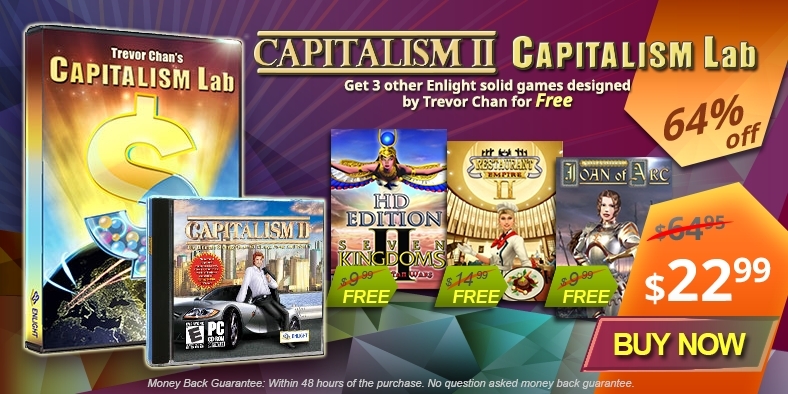 If you are new to the Capitalism series, you can now get both Capitalism 2 and Capitalism Lab, plus 3 free games, for only $22.99! It seemed that the times of good business simulations was over – and then Capitalism Lab came along the way. I’ve been playing business sims since I started playing computer games almost 20 years and whilst back then there was a rich variety of good games the genre almost dried out in the past years. However, CapLab is a masterpiece, a bit like “The Lemmings”: pretty easy to learn, very hard to handle. So if anyone is looking for a game that provides more than just two hours of scripted gameplay, even though it may be a call of duty, you should give this one a try. I’ve been playing Capitalism Lab during its beta phase for countless hours. It never gets boring, after you finished it you won’t want to change for another game, you simply start over again, trying to avoid mistakes you made before, invent other products or strategies. Usually I don’t feel grateful when it comes to products, but there are a few exceptions. Regarding games, Capitalism Lab is one of them (and the FIFA-Series for my XBox ). So thanks, Enlight Software. Risk Free Purchase with Money Back Guarantee! If you purchase the game and for whatever reason you want a refund, you may email us at info@enlight.com within 48 hours of your purchase to request a refund. We will provide you with a full refund, no questions asked. The Subsidiary DLC introduces new features for conquering the business world on a grander scale! The City Economic Simulation DLC lets you build new cities from scratch, form your own political party, and assume the role of mayor while simultaneously growing your business empire! The Digital Age DLC offers you an exciting opportunity to build a tech startup at the dawn of the digital age and oversee its growth to eventually become a tech powerhouse that joins the ranks of tech titans such as Microsoft and Google. Click here to see the system requirements of Capitalism Lab. The game will be delivered to you via digital download. After ordering Capitalism Lab, you will be provided with a download link to download the game installer. (C) Copyright 2019 Enlight Software Limited. All rights reserved.